Today is finally officially my first day in the classroom *as* the student teacher, even though I've been visiting and helping once a week since September. I'll be sure to share the highlights of my journey here- I absolutely adore preschoolers because every day is an adventure with them! I wore this outfit when I was in the classroom last week. It just felt like a dress day, but I stayed nice and warm pairing with this long draped cardigan! And of course leggings were a must in this Chicago winter. I topped it all off with my new favorite boots, which were a Black Friday buy. It ended up being quite perfect- so comfortable and warm and still very nice looking at the same time! Have you ever tried this combination before? Well, the schools are closed again today, so my second day of student teaching is being spent stuck at home too. Oh well, at least the kids will be safe and warm at home. And meanwhile I'm trying to make the most this time to get things done in the house. Here's a casual outfit I wore last week. 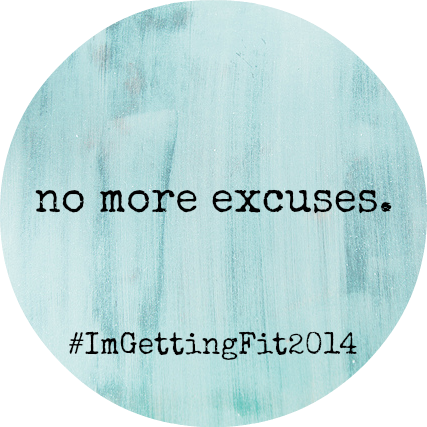 Also, #ImGettingFit2014 doesn't officially start until February, I believe, but I've started sharing my workouts and healthy meals on instagram get started. I'd love for you to join me, the more the better, because the more encouragement we can all offer each other! The link to my instagram can be found in the sidebar and here. Although they don't really show up in pictures, there are polka dots on these coral jeans, making them one of my favorite pairs, obviously! And the sweater is covered in adorable little hearts. Now normally I wouldn't be one to wear a top covered in hearts, because it would make me feel like I'm about 5 years old and while that's not necessarily a bad thing, I work with 5 year olds- I don't need to be one too ;) But when I saw this sweater from Old Navy last year, I was just drawn to it. Maybe it's because the hearts are half pink- half which gives it a cooler vibe, and I love the brown with it. It's also incredibly soft, which is a big plus. And today marks the beginning of a big change in my life for the next 4 months: student teaching. I'm going to be a full-time student teacher in 2 different classrooms to finish up my Master's and get my teaching degree. And I'm really excited about it! It's going to be lots of work without a doubt, but I'm really looking forward to getting to be in the classroom every day with these awesome kids that I've already gotten time to know and love. And I'd be lying if I said I wasn't excited about wearing "teacher outfits" every day. I'm already planning out what I'm going to wear into the future. Today would have been my first day in the classroom as the student teacher too, but due to the -25 degree feeling temperatures, all the schools are closed around here. So I guess I will be staying warm inside instead for now! Thursday was one of those days where I really didn't want to leave the house, but I had to go to class. So if I had to leave, I figured I might as well be comfortable. This oversized top from H&M is so awesome because it fits the bill perfectly. I wore it with some jeans, black boots, simple gold jewelry, and this scarf that I recently made! The whole thing was crocheted with my fingers, so it was so easy that anyone could do it! And I'm really digging how it turned out. I may be working to get more fit as I posted about yesterday, but I know and love my body for what it is. I have curves, and I'm proud of them! Take this animal print top that I wore last week to my second student teaching contract meeting. I made sure to get a picture so you could see how it looks on me. Tell me this isn't a top that was designed for a girl with curves- it fits them perfectly! 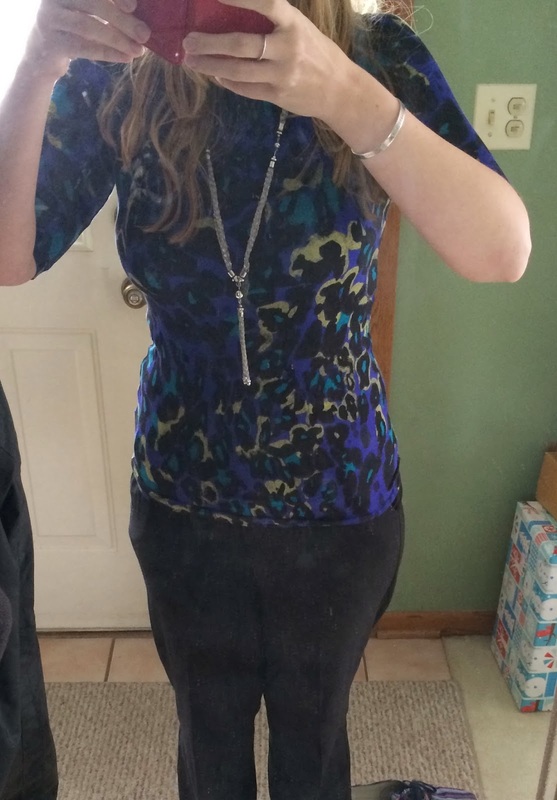 This top is from Sofia Vergara's line at Kmart, which I am really digging, because I think all of the clothes are designed this way to look good on women who have some curves. Plus the prices are Kmart affordable! And yes, this was two days in a row that I wore this bootcut dress pants. I've had them so long I can't remember where I got them from, but I think this is a great staple for your wardrobe, and the ones below are really similar! But excuses, excuses, am I right? Exercise kind of took a back seat over the fall. I got it in when I could, but it definitely wasn't the priority it was for me before. And I hated it, I really did. Mostly I hated how I felt without getting workouts in. So lately I've really recommitted, and it feels great. But I still need to get my body back to where it was, and then continue on my journey of fitness even further. I'm going to start student teaching a week from today (ah, exciting!) which means my life will be totally different than it is now. No more night classes, but full-time work each day, starting early. That really leaves the best time for my workouts to be early in the morning, before I get ready. I know this is going to be tough, especially in the beginning. So when I saw Kaitlyn's post over at Wifessionals today, I felt like it was a sign. I have followed Tamara and her blog, The Workout Mama, for some time now and she is awesome. 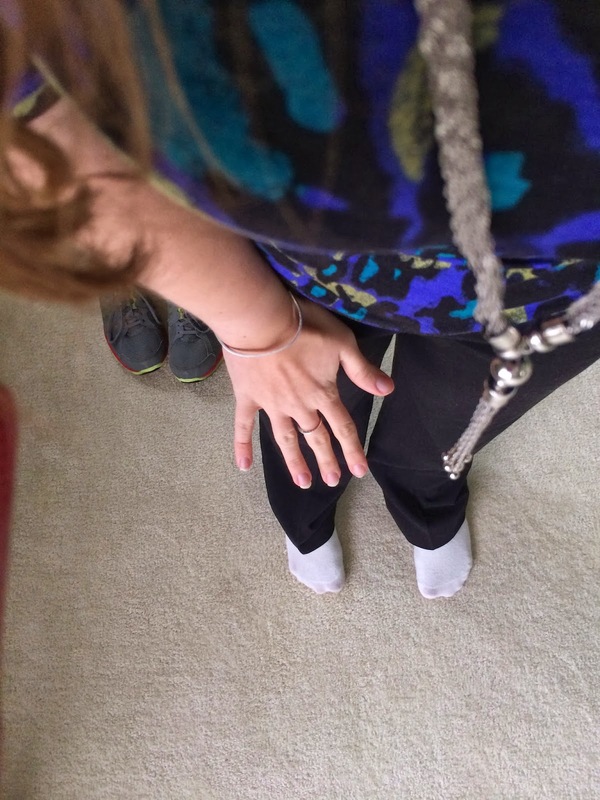 Ever since she started doing monthly online-run bootcamps, I really wanted to do one. Tamara is a personal trainer so you better bet she knows what she's talking about and she provides workouts at the beginning of each week with videos, along with a support system through a closed Facebook group, and more! 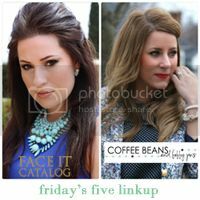 When Kaitlyn posted about joining in on this one, and creating even more support opportunities through link-ups and instagram, I decided I was in. This should be just the motivation and encouragement I need to make it through the adjustment to early morning workouts. I'm really excited to do this, and I'd love to see as many awesome ladies as possible participating! Want to join me? Let me know if you do so we can connect! Oh hey, the blog has a new design! I'm still working on it, but I was having issues with comments in chrome showing up in white font. Could you do me a favor and let me know if this happens for you? You know those pieces that you see on the rack and you know you have to have them and there is no possible way you can leave them there in the store without you? This top was one of those pieces for me. First of all it is polka dots, hello! And adorable black and white ones! I think the name of this blog can let you in on my love for them. And then it's a beautiful cobalt blue! If you were to get a look at my wardrobe, organized by color, you could easily see that blue is the dominate color in my tops. And last but not least, it is a chiffon tunic, which I discussed my love for in my last post. 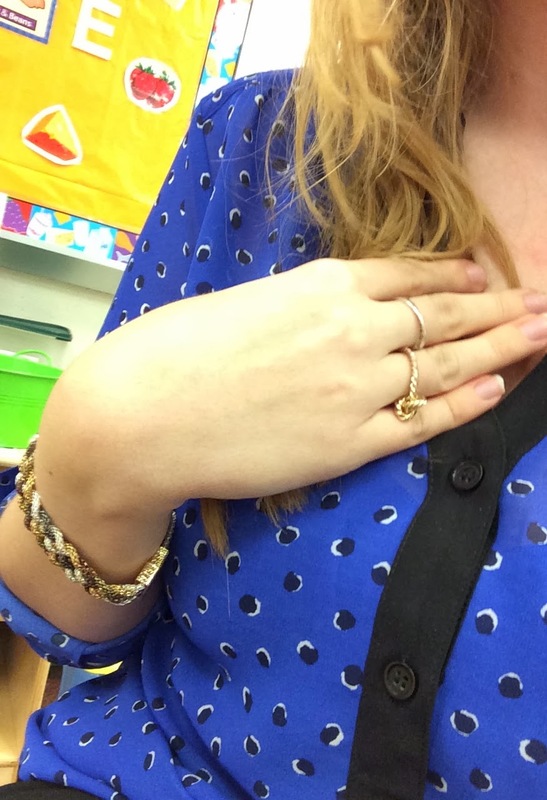 So, this top was perfect to wear for a day in my preschool classroom. What is your most recent purchase that you had to have? Hi, welcome to Lace, Stripes, and Polka Dots! I'm Alisa, and I'm a grad school student who works with kids and lives on a budget. I started this blog to chronicle my own style journey, and I hope you'll join me! how colorful do you go?